California’s devastating Camp Fire has finally been contained. The fire — California’s deadliest and most destructive on record — scorched more than 150,000 acres over the course of 17 days before firefighters got it under control. And while the work to contain the fire has come to an end, for emergency rescue crews, insurers, and investigators the work is only just beginning. Before containment, the fire tore through urban areas across Paradise, Chico, Oroville, Magalia and other cities destroying almost 14,000 homes, 528 commercial structures, and close to 4,300 buildings in its path. Most of those initially marked as missing have emerged, hundreds of people still remain unaccounted for almost three weeks later. Our hearts go out to all those affected by these devastating events. The Camp Fire is already a source for history books, but one record you may not know about is the largest UAV disaster response to date. 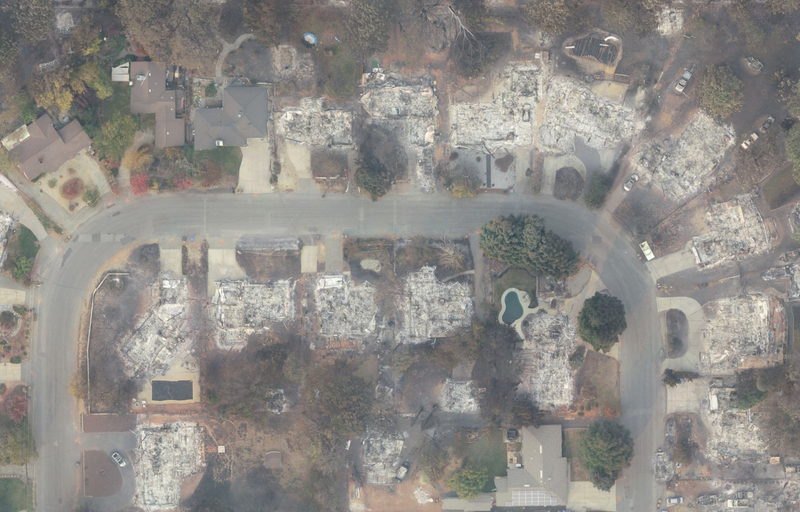 Drones have increasingly become go-to tools for collecting aerial insights in the wake of the disaster, but the efforts that unfolded after the Camp Fire are unprecedented. Read on to learn how rescue teams used DroneDeploy to map the destruction to aid the recovery process in the days leading up to its containment. Over three days, 16 teams of public safety professionals from an interstate agency task force of police, fire, and rescue personnel worked day and night to complete 500+ drone flights capturing 70,000+ images of the areas surrounding Paradise and Magalia. The result: close to 500GB of drone data which DroneDeploy turned into 26.5 square miles (15,000 acres) of high-res aerial maps is now accessible to state agencies and the public to assist in the recovery efforts. This data will be used to aid search and rescue operations, assist with the planning and response to potential mudslides, issue FEMA relief funds, and help process insurance claims faster so that wildfire victims can get back on their feet. Individuals from Menlo Park Fire Department, Alameda County Sheriff’s Office, Butte County Sheriff’s Office and others joined forces with UAV experts at DJI and Scholar Farms to collect the data. The images have since been transformed into maps that are highly accurate, geo-referenced, and overlaid with street names. These maps are critical tools in the recovery process, as neighborhoods are no longer recognizable. Street after street of burned buildings and trees now blend together, making it difficult to discern one block from the next. Coordinating all 16 drone teams would have been challenging enough with the dense smoke, high winds, and low visibility — but planning hundreds of flights with dozens of pilots meant everyone needed to be on the same page. And teams on the ground turned to DroneDeploy to manage flight planning and data collection. The next challenge came by way of processing close to 500 GB of data. With no internet access in the region, the UAV teams had to transport hard drives of data to San Francisco, while Jono Millin (DroneDeploy’s co-founder) and members of our sales and engineering teams uploaded imagery throughout the night and the following morning. The next day the data was delivered in 75 maps after the engineering team spun up a massive processing cluster in our cloud to manage the influx of data. In the end, 1.4 trillion pixels of captured drone images would become a 100 billion pixel map. The maps are impressive, but we’re more impressed by how the teams on the ground have put them to use. With up-to-date visuals, fire teams are charting the damage, and planning next steps. Winter rains are now on the horizon, and the burnt foliage increases the risk of floods and impending mudslides, posing even more harm throughout the region. So the Butte County Sheriff’s Office is using the imagery to identify areas of concern and plan their response accordingly. The maps are even being used by search and rescue teams to spot any missing persons who may be in the area. Wildfire victims are also putting the maps to good use. With entire neighborhoods mapped, homeowners have been able to submit the imagery to insurance providers to process claims immediately — a process that traditionally can take days or weeks. Many have used the imagery to gain access to FEMA relief funds for the families affected by the fires. In times like these, it’s all about lending a helping hand. And we’re proud our team was able to help play a small role in response to the fires. We wish the remaining fire and rescue teams speed and safety in the recovery. And to all the families, individuals, and businesses in this tragedy that have suffered loss, please know that our hearts are with you. We hope these efforts can help you speed up the rebuilding process.